The fall of 2017 is set to become a “before-and-after” moment in the ongoing efforts of AE911Truth to educate the world and bring about a new World Trade Center investigation. That’s because, over the course of the next two months, Dr. Leroy Hulsey will be releasing the findings of his two-year computer modeling study on the collapse of World Trade Center Building 7. At the same time, we will use his report as a vehicle both to intensify our pressure on Congress to open a new investigation and to finally hold NIST accountable for its fraudulent account of the WTC destruction. Though originally scheduled for release in August, a draft report of the study is now on course to be issued in mid-October. A six-week public comment period will follow the release of the draft report, allowing for input from the public and the engineering community. The final report, which will incorporate constructive comments and will be vetted by peer reviewers, will then be published in early 2018. 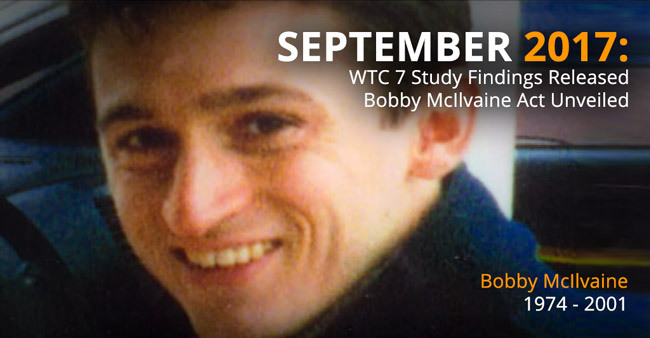 Between now and September 1st, our goal is to raise $10,000 to cover the costs of these events and other initiatives aimed at bringing attention to the WTC 7 Study and the Bobby McIlvaine Act. On top of travel for Richard Gage, Peter Ketcham, and three staff members, we need to cover the cost of renting the National Press Club room, issuing three nationwide press releases, and printing 535 congressional packages. Plus we’re asking you to invest in helping us produce a slick video that will be released alongside Dr. Hulsey’s draft report. It will cogently summarize his findings and show animations of the models — including a model that actually replicates the observed collapse of WTC 7 precisely. This is the most important time of the year for our mission and perhaps the biggest moment in AE911Truth’s ten-year existence. With your support, we can raise the $10,000 we need by September 1st to make this fall a turning point in the pursuit of 9/11 Truth. Please donate generously today. For those of you near Fairbanks and Washington, D.C., and those traveling greater distances to commemorate 9/11, we invite you to attend the events and join us on Capitol Hill. To volunteer for the latter, please email us at Congress@AE911Truth.org.